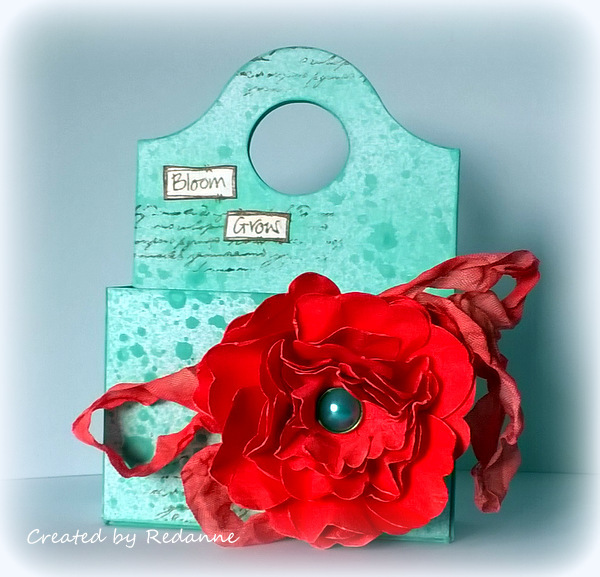 During the month of February, Eileen Hull's Inspiration team are sharing projects made with Eileen's range of inks- ColorBox Blends by Clearsnap. I need to say up front that, at the moment, these inks are not available in the UK, but hopefully they will be soon. ColorBox Blends come in a range of 16 colours, they are produced in sponge top dispensers that are so easy to use. They can be used for paper, card, fabric, wood, clay and more! The dispensers hold 10 times the amount of ink of a normal ink pad. You just need to heat set them for permanence. I used three colours of ColorBox Blends - Bay, which is a soft teal colour, Nutmeg and Stop, which is a pretty amazing red! I used the inks in four different ways. 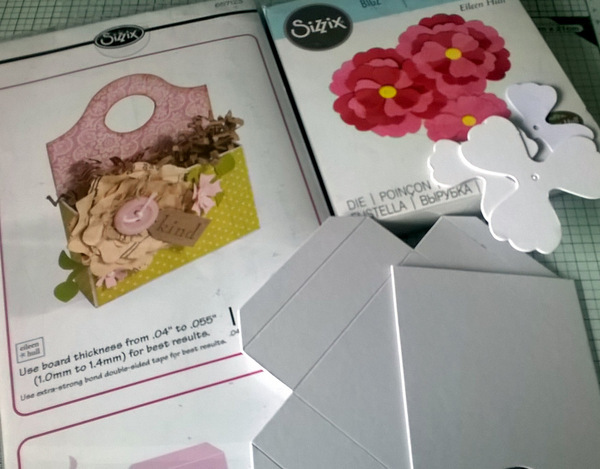 I die cut the elements I wanted to use - Eileen Hull's Bag, Caddy die (Sizzix 657123) and Eileen Hull's Flower, Pansy die (Sizzix 661109). I cut the flower three times, to give a nice big flower. I decanted some of the ink (Bay) into a spritzer bottle and added water in a ratio of 50:50 and spritzed the caddy all over (coverage is excellent) and heat dried the pieces. 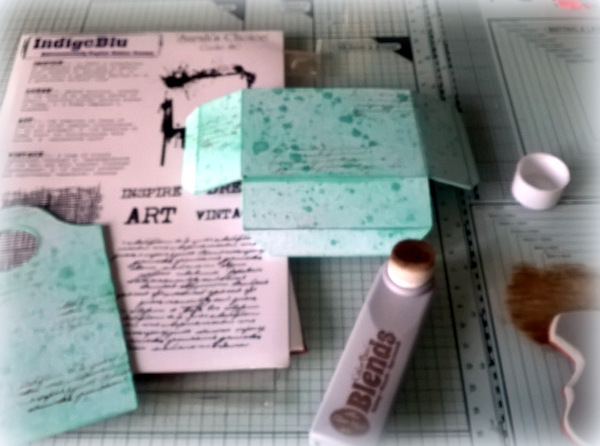 I used a third colour of ColourBox Blend (Nutmeg) to stamp here and there using a script stamp by IndigoBlu. I didn't use a stamp block, as I wanted a more random look. I coloured the flower direct to card, colouring both sides. Once dry, I scrunched them up and fastened the petals with a pearl brad. To colour the ribbon, I dabbed the ink on my glass mat, added some water and dragged the ribbon through and then heat set the colour. To finish off I stamped the words Bloom and Grow with Nutmeg and added them to the caddy. Another look at the finished caddy. 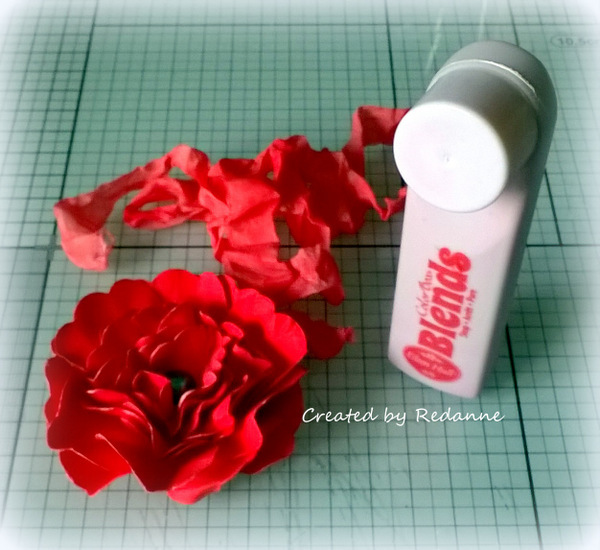 If you would like to see how my Teamie, Tracy used the inks you can see her post here. Thanks for your visit today, I really appreciate that and any comments you leave. Love that gorgeous teal colour - what a beautiful box to display the new colour line from Eileen. Showstopping flower too! What a nice caddy Anne, I like the colour combo and the finish you get. A fabulous Caddy Anne and the red flowers really pop against the blue. Fabulous! Anne. Just love the teal colour and the mottled effect you have created on the caddy. Your flower is gorgeous -as are all your crafted flowers. A wonderful showcasing of the new inks .Fingers crossed they will be on sale in the UK . Beautiful make Anne. Those inks look great - super colours. The techniques you used have beautiful effects Anne- that flower is so saturated- I wondered how you got such vibrant color- don't think I have ever done that, but now will! Also love the aqua- awesome project! Gorgeous colors Anne - I know nothing about the brand you used but the colors are stunning. As I am particularly fond of red - your red "STOPPED" me in my tracks. Love the soft bay shade with the bright flame pop of the lush flower. And how perfectly you've matched the ribbon too. Haven't seen this colorbox product yet, but I have some of the ink pads. What an amazing project you've created with these dies...TFS & Hugs. Oh how fun and love that dramatic red...gorgeous! Great to see the close up photos of this striking project. I love your inky background and your flower is stunning. Rosy red and turquoise is such a beautiful combination--cool techniques, too. A great project! Sorry typing on my phone, should be - "on your box", "stampings and " and "great dies"! Oh my gosh! I love, love, love your project. I have these dies and have NEVER used them but am so inspired now that I can't wait to dust them off and create something. The color palette is so beautiful, and that flower really makes a statement. waoo nice post about "Clearsnap ColorBox Blends for Eileen Hull"
i just had to stop in and say i LOVE this project and the colour combinations and techniques! 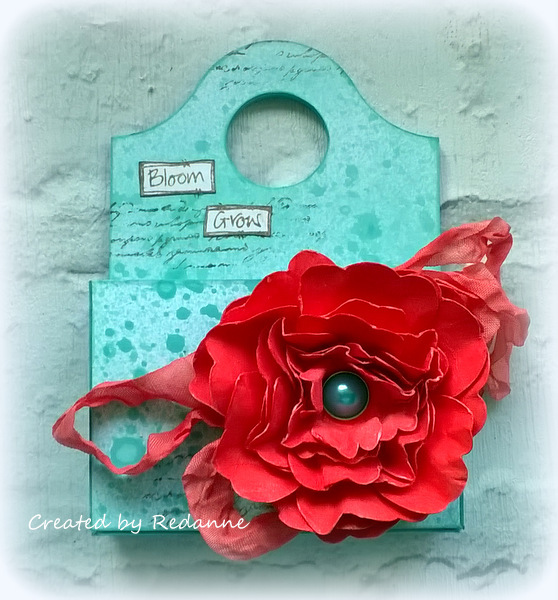 Fabulous project, Anne, and those Colorbox Blends are so bold and beautiful, especially Stop! What a perfect name, because that red makes me want to stop instantly in my tracks; what a head turner of a color! And so is your amazing flower! 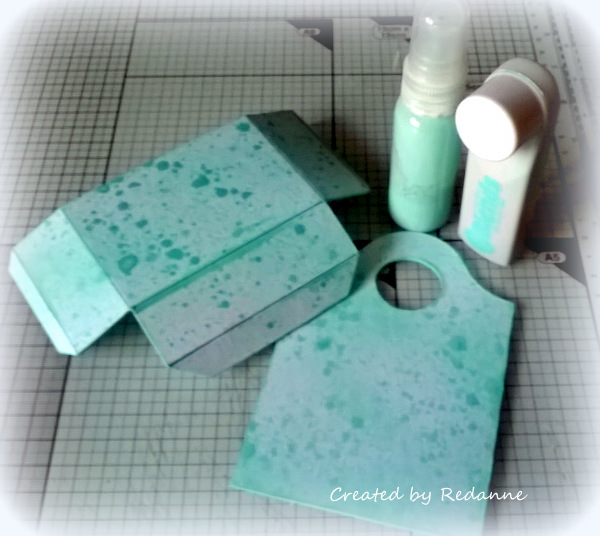 Clever idea to make your own spray with the ink--a beautiful result on that box! Hugs!